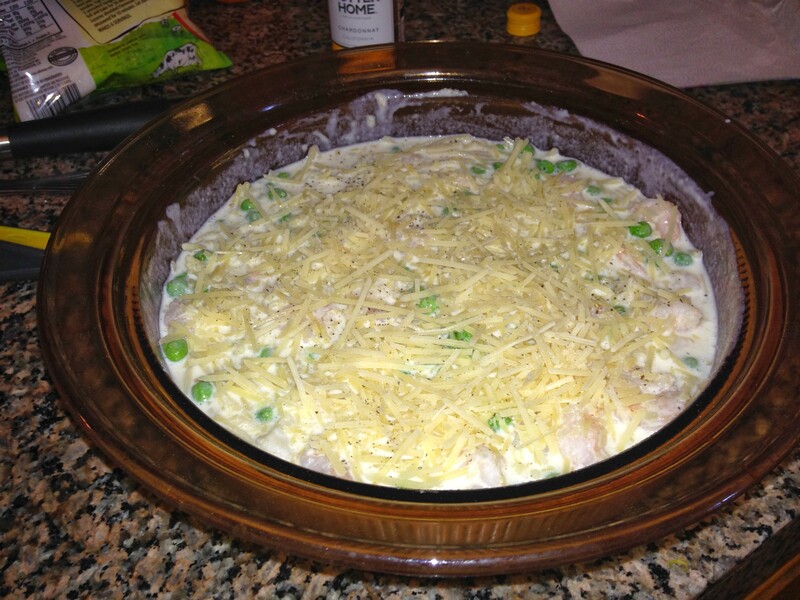 Seafood Casserole – Trees & Flowers & Birds! 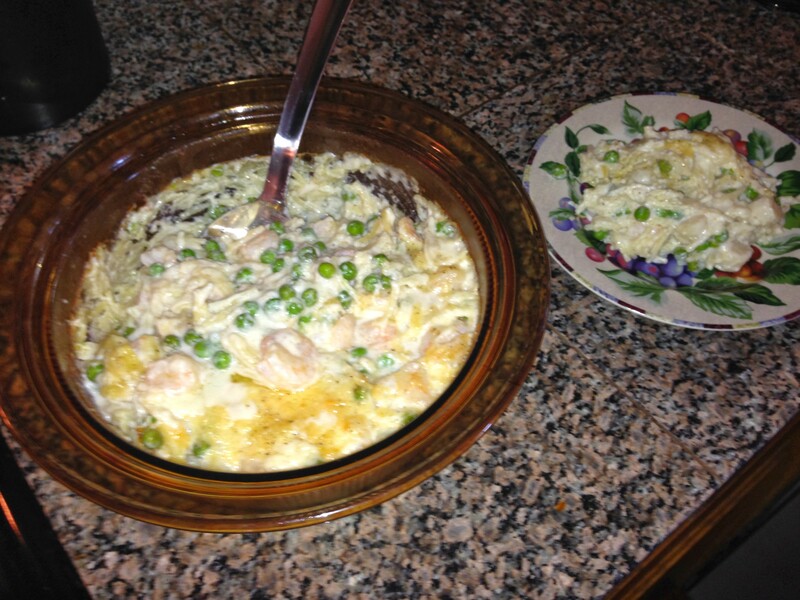 Seafood Casserole – adapted from here. ½ lb fresh shrimp – peeled and deveined. Smaller ones are best. Cook spaghetti per directions on the package. Drain and rinse with hot water. Lightly butter a 2 quart casserole dish, or 4 individual 2 cup ramekins. 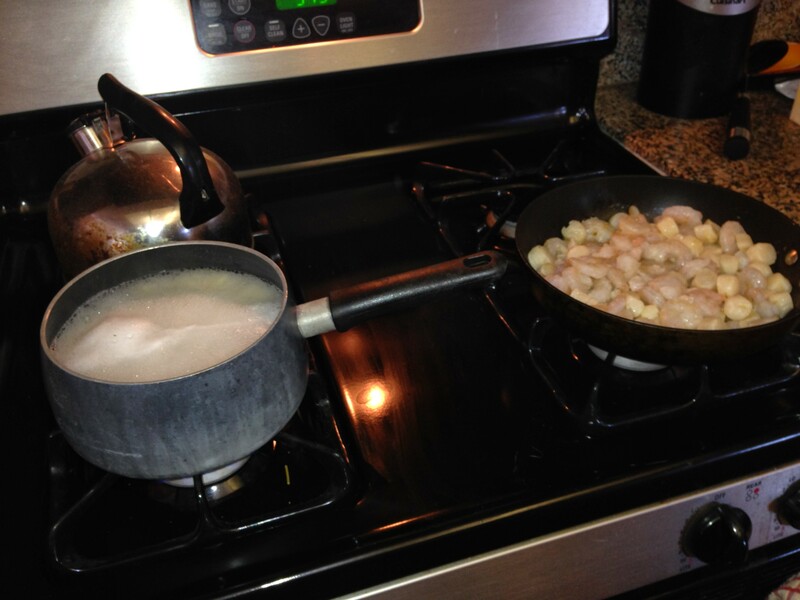 Thoroughly rinse scallops and shrimp in cold water, drain, and cut scallops to desired size. I like a bite sized piece. Melt 3 tbs of butter in a sauté pan. Add seafood and mushrooms and sauté over medium high heat. 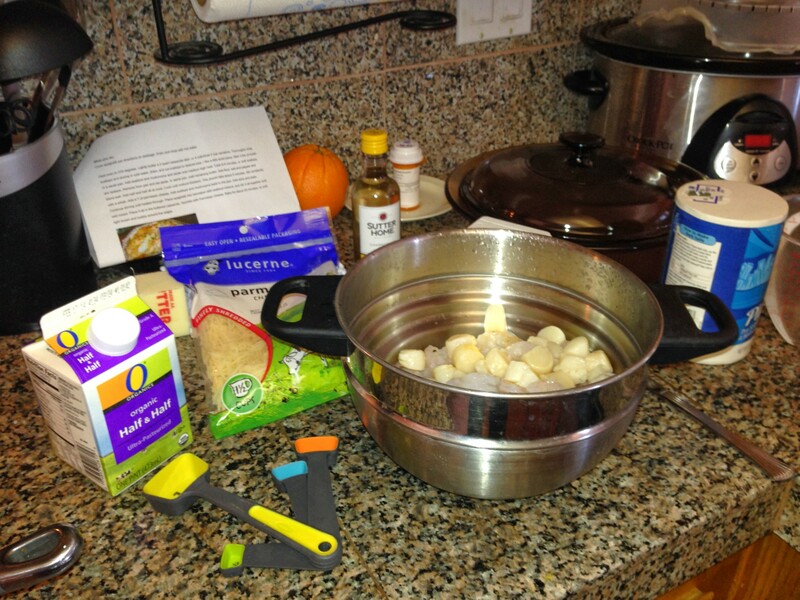 Cook 6-8 minutes, or until scallops are opaque. In same pan, melt remaining butter. Add flour, salt and pepper and blend well. Add half and half all at once. Cook until mixture thickens. This should take about 5 minutes. Stir constantly with a whisk. Add 4 T of parmesan cheese. Place it all in the buttered casserole. Sprinkle with Parmesan cheese. Bake for 25-30 minutes, or until light brown and bubbly around the edges. My adaptations – no mushrooms, scallops were already the sort of bite sized frozen kind which I just thawed, not mixing all the ingredients in the sauce pan (unless you use a really large one, that would have been a tricky task, and since my casserole dish is a 2.5 qt it was easier to combine everything in that), pasta box was the already reduced sized spaghetti pieces. Since the standard response is “Pics, or it didn’t happen!” – here you go! 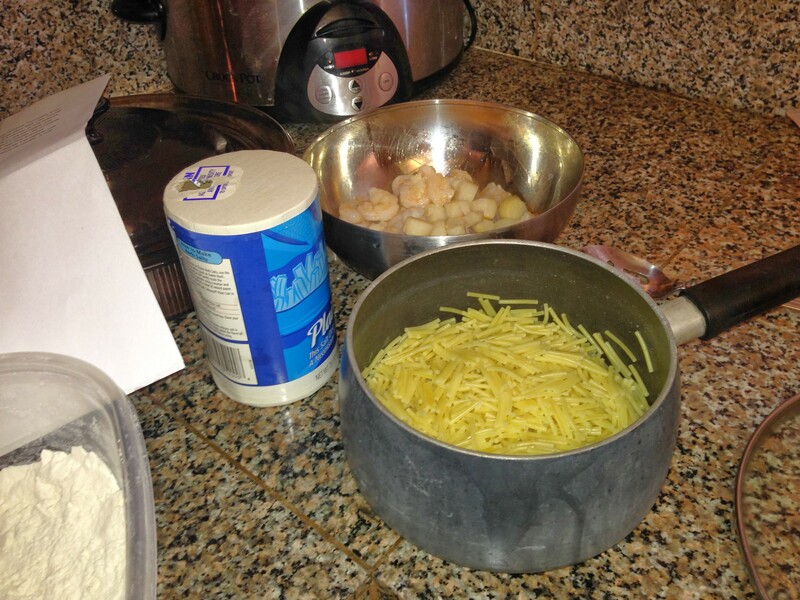 Pasta & seafood cooked and set aside, waiting for the sauce to be done. Ready to go in the oven with last of the cheese sprinkled on top. Finished casserole in the baking dish and ready to eat on my plate! This dish was rather easy since there is no excessive chopping, and it was nice to have that time while it was in the oven to clean up all the other prep items. It is also really yummy! Of course, you can’t really go wrong with me with a pasta + shellfish dish, but I was really happy with the flavor balances. About the only thing I would do differently the next time is possibly only use scallops (the small shrimp ended up a little too tough for me) and increase the peas & cheese. This re-heats very too which is important to me since no one else in my house would eat this so unless the boyfriend comes around to help out, this is all for me!